Blog //Announcing the #Codespeak Kit! 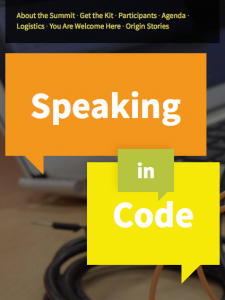 Today, the Scholars’ Lab is pleased to make a few modest contributions toward the broadening of a conversation we opened last fall, in a summit for digital humanities software developers called Speaking in Code. The summit, generously funded by the National Endowment for the Humanities and UVa Library, brought together 32 advanced developers working on humanities data, tools, and systems, to discuss ways to create inclusive, welcoming developer communities and to address the social and intellectual implications of tacit knowledge exchange in their craft. On the codespeak site today, you’ll find links to a customizable kit that anyone can use to host their own Speaking in Code gathering. It includes our starter bibliography, advice for welcoming a diverse group of participants and planning an event, and the framework of a Jekyll website (complete with instructions), ready for you to modify and publish easily, using GitHub Pages. You’ll also find the beginnings of a set of DH developer advice posts and “origin stories,” to which you are invited to contribute, and an invitation to continue the conversation on Twitter (hashtag #codespeak) and IRC (Freenode channel #speakingincode). A white paper on the outcomes of the inaugural summit will also be available soon, and summit particpants may have other documents to share. Cite this post: Bethany Nowviskie. “Announcing the #Codespeak Kit!”. Published July 24, 2014. https://scholarslab.lib.virginia.edu/blog/codespeak-kit/. Accessed on .